MC. 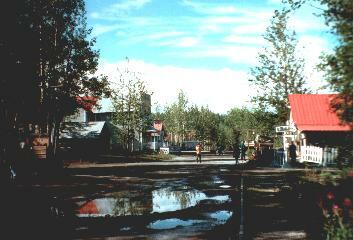 CARTHY, JULY 1997 - Alaska is the land of the goldrush. Nowadays, the real goldmines are all but a few little ones closed. Now black gold is the primary treasure, as is illustrated by the Alaska pipeline you encounter along the road on several occasions. 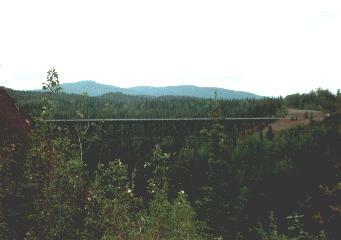 Deep into the Wrangell mountains, in the beginning of the 20th centrury, a mountain of copper was discovered. This was the foundation of the little mine town Kennicott and the village of Mc. Carthy. The only connection with the civilised word was the railroad, used to transport the copper. The train left Kennicott for the last time in november 1938. People that wanted to leave the wilderness could come along. There was no time to pack a lot. 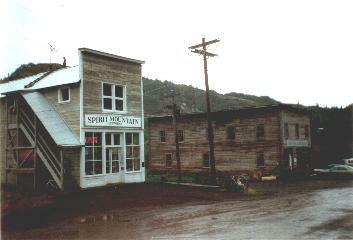 This created the ghost town of Kennicott, which is now pretty much like back in 1938. The rails were removed later and the railroad was filled up with gravel. This is now the only road to go to Mc Carthy. The road starts in Chitina, the last 'village' of the civilised world (only a couple of wooden houses) . From there on, for about 100 km, look out for iron bars and nails used to hold the rails sticking out of the road, as heavy rains and melting ice bring them constantly back to the surface. You don't want to have more than one flat tire over here - next to the road one finds now and then an abandoned car wreck. This trip took us more than 6 hours and we stopped to collect 14 nails (which are about 15 cm long)... But it was the trip of a lifetime, it's really going into the wilderness. We crossed magnificient rivers and the sight of the Wrangell mountains was fantastic. The railroad bridges used to be scary to cross by car (wooden planks missing and no fence) but this is not the case anymore, since the end of the eighties they are 'modernised'. End of the road, there's only a parking lot and a camping area. To go to Mc. Carthy, the only way is by foot, as you have to cross the river - there are only a few cars in Mc. Carthy, brought there in winter when the river is frozen. There used to be a cable crossing the river with a 'tram' attached to it (and you had to operate it yourself, manually). This is now history, the cable was still there in 1997, but the 'tram' was not operational anymore since a few years. There now is an (ugly) iron foot bridge. The real goldmine for Mc. Carthy is now tourism. And the guys just before the footbridge are the first to sell you tickets for mountain bike tours, glacier tours, plane trips, nature walks,... On the campsite, there is no running water, no sanitary facilities, no electricity... this is close to the real wilderness experience. The Mc. Carthy village is pretty much like it used to be, albeit 'adapted' to tourism demands. The lodge and the hotel are both 'old style'. The lodge has a sign "showers", which is more than welcome after a few days, but showers are only possible in the evening and you have to bring your towel. Entering the lodge, there is also a sign asking visitors 'to declare their guns at the bar'. Drinks are expensive, but what did you expect... ? The pizza house next to the hotel sells 'the best pizza in America', and I can tell you this is not a very big overstatement. A trip to the Kennicott mine village, some miles further, is even more like going back into time. Half of the buidings and houses show clear signs of decay, the other half is being repared gradually. You can enter the houses, but not the old mine - since this is dangerous, it's only possible with a guided visit. There used to live several hundreds mine workers here. Now a real ghost town. 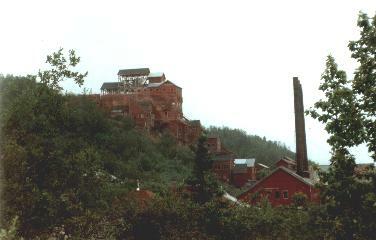 The debris of the copper mine activities are still there, large piles of rock. Not to be confused with the morenes (huge !) of nearby Root glacier. Drinking a cup of coffee in the 'Kennicott Glacier Lodge' can help your imagination going back into time.